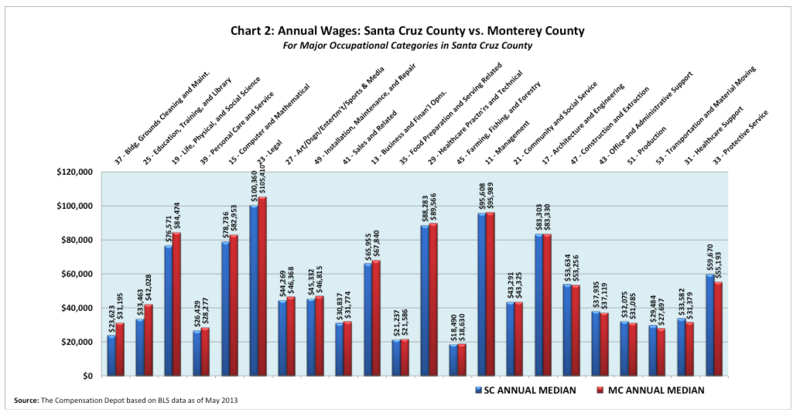 How do Santa Cruz and Monterey wages compare? WHY do Transit Bus Drivers in Santa Cruz make 28.7% more than the drivers in Monterey? WHY do Pharmacy Aides in Santa Cruz make 51.3% less than those in Monterey County? WHY do Tax Preparers in Santa Cruz make 45.9% less than those in Monterey County? This analysis, like the prior wage comparison with Silicon Valley is based on data from the May 2013 National, State, Metropolitan, and Nonmetropolitan Area Occupational Employment and Wage estimates from the U.S. Bureau of Labor Statistics. My analysis begins by providing a high level overview of the competitive landscape, looking at 22 major job functional/occupational categories into which 238 specific job classifications have been “rolled up”. These categories are based on the U.S. Bureau of Labor (BLS) Standard Occupational Classification (SOC) system covering the entire spectrum of Santa Cruz jobs. 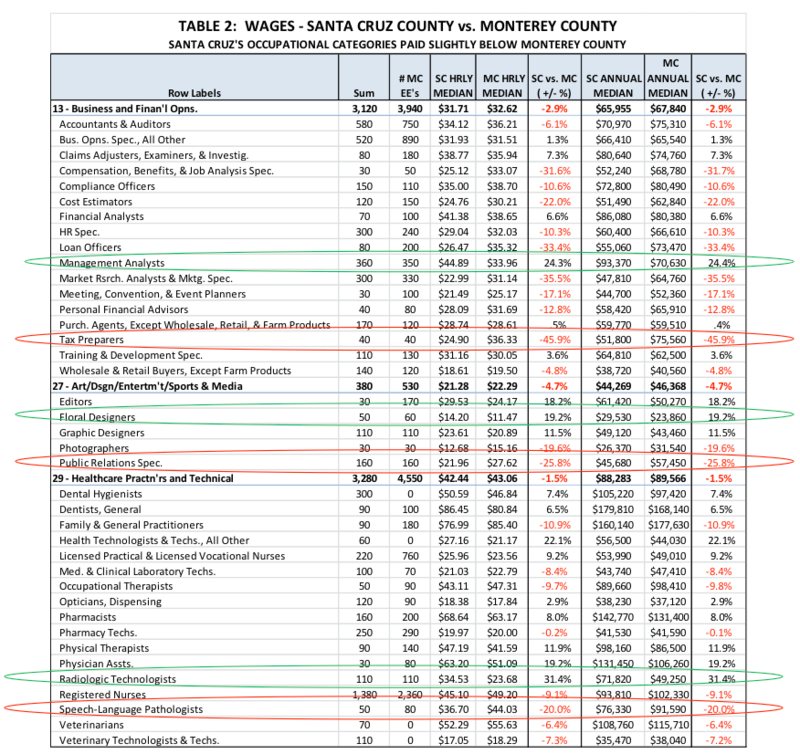 Refer to Charts 1 & 2: Santa Cruz median wages lag Monterey County in 15 of the 22 major (high level) occupational categories although 13 categories lag by less than 10% with 11 of those lagging less than 5%. In general, the wages between the two counties are close, indicating a relatively healthy balance in the competitive labor market. (Caution: These categories are very broad, containing jobs with a wide range of pay competitiveness. For example, the Building and Grounds Cleaning and Maintenance category (for Santa Cruz) includes five job titles ranging from 120 First-Line Supervisors of Housekeeping & Janitorial Workers (+6.8%) to 1,630 Janitors & Cleaners (-43.6%). It is interesting that the requirements (e.g., education and skill sets) for these job classifications are quite different, underlying the fact that possessing a particular level of education and skill doesn’t necessarily translate into the availability of a position in which one can be gainfully employed. Most of us still have painful memories of libraries closing and school districts handing out pink slips in the not too distant past. Obviously, there are other factors at work here also. One of those factors may well be the differences in makeup of the employment sectors of the two counties. This study focuses only on the occupational categories and their underlying jobs in Santa Cruz County – jobs that also exist in Monterey County. However, Monterey County has a more diverse array of jobs (a somewhat different “competitive landscape”) than Santa Cruz County. Employers in Santa Cruz County reported employees in a total of 323 job classifications to the Bureau of Labor Statistics (BLS), whereas Monterey County reported employees in a total of 361 job classifications. 78 of Monterey County’s 361 job classifications were not reported to BLS by employers in Santa Cruz County. That represents 24.1% of Santa Cruz’s jobs, a significant difference. It’s conceivable that the availability of this number of “additional choices” could impact the “competitive balance” of some of the job classifications in the analysis. The job titles of these 78 classifications suggest that many of them are associated with the Monterey Airport and the travel industry, as well as Monterey County’s significantly larger agriculture industry. [As a side note it’s interesting that all but 8 of Monterey’s job classifications are included in the database for the San Jose Standard Metropolitan Statistical Area or (SMSA)]. A complete list of these 78 jobs, with their median wages, sorted by occupational category is available along with other detail from this analysis under the “Downloads” tab at www.thecompensationdepot.com. Space constraints in this article preclude my inserting all the underlying analytical detail for each of the 22 major occupational categories highlighted above, so tabular details are included in this article for only three groupings of the above 22 major categories. I’ve included detailed comparisons for major occupational categories representing the “less”, “average” and “most” competitive categories from the charts above. The top category, Life, Physical and Social Science (-10.3% overall, with three underlying jobs) that range from +3.4% (Urban & Regional Planners, green oval) to -15.0% (Environmental Sciences & Specialists, Including Health, red oval). The second category, Education, Training and Library (-25.6% overall, with 6 underlying classifications) has a wider dispersion of competitiveness ranging from +26.3% (Self-Enrichment Educ. Teachers, who apparently practice what they teach, green oval) to -56.4% (Substitute Teachers, red oval). The third category, Building, Grounds Cleaning and Maintenance (-32% overall, with 5 jobs) has a competitive range of from +6.8% (First-Line Supvr. of Housekeeping & Janitorial Workers, green oval) to -43.6% (for the employees they supervise, Janitors & Cleaners, Except Maids & Housekeeping Cleaners, red oval). Table 2 is provided to focus on three occupational categories positioned “mid-range” in the Chart 1 competitive distribution. The top category, Business and Financial Operations (overall -2.9%), includes 17 job titles found throughout the diverse enterprises in Santa Cruz. The competitiveness of individual jobs ranges from The Management Analysts (+24.4%, green oval) to Tax Preparers (-45.9%, red oval). The second category, Art/Design/Entertainment/Sports & Media (overall -4.7%) includes only 5 jobs ranging from Floral Designers (+19.2%, green oval) to Public Relations Specialists (-25.8%, red oval). The last category, Healthcare Practitioners and Technical (overall -1.5%) includes 17 underlying job classifications. The competitiveness of those jobs ranges from a high for the Radiologic Technologists (+31.4%, green oval) to a low for Speech-Language Pathologists (-20%, red oval). 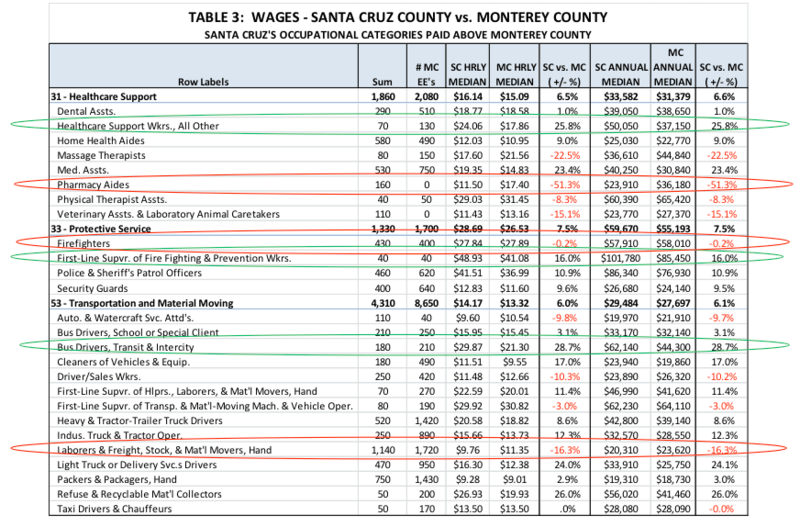 Table 3 provides detail on three of the six occupational categories where overall Santa Cruz wages are higher than those of Monterey County. The first occupational category is Healthcare Support which leads by +6.6% overall. It includes 8 job classifications ranging in competitiveness from +25.8 for Healthcare Support Workers, All Others (green oval, to -51.3% for Pharmacy Aides (red oval). The second occupational category is Protective Service which leads by +7.5% overall. It includes only 4 job classifications ranging in competitiveness from +16.0% for First-Line Supervisors of Fire Fighting & Prevention Workers (green oval),to -0.2% for Firefighters (red oval). The third occupational category is Transportation and Material Moving which leads by +6.1% overall. It includes 14 job classifications, 9 of which have higher wages than Monterey. These jobs range in competitiveness from +28.7% for Bus Drivers, Transit & Intercity (green oval),to -16.3% for Laborers & Freight, Stock and Material Movers, Hand (red oval). In doing this analysis I was struck by the number of times the occupational category (Building, Grounds Cleaning and Maintenance) and the underlying job classifications (Landscaping, Lawn Service & Grounds-keeping Workers and their Supervisors) came to the surface. One of my objectives, as stated above, was to examine the “competitive landscape” of Santa Cruz and Monterey Counties. It occurred to me that we are the competitive landscape. As individual and collective wage earners we are the grass roots and the green shoots . . . the human capital that is paid to create and/or maintain all other forms of capital. This role is a unique privilege that carries with it the responsibility to conserve and preserve . . . responsibilities not dis-similar to those engaged in creating and preserving the beautiful landscapes of our counties. The WHAT questions are usually much easier. Most of us don’t have the power or resources to fix a wage problem for the entire county, but many of us do have the power to influence the organization in which we work. For example, let’s say you suspect that you have jobs in your organization that are paid significantly below or above where they should be paid. WHAT can you do about it? Fortunately, there are actions you can take. As a first step you might want to validate your suspicion by participating in a reputable salary survey to secure valid and reliable data against which you can assess how your jobs are paid relative to the specific labor market in which you compete. If you can’t measure it, you can’t control it! Once you know how your salaries compare you can develop a strategy, plan and budget to correct the problem over time, as your organization can afford it. Pay problems become increasingly more difficult to correct as an organization (even a county) grows. They also tend to be more difficult to correct during “good times” when employees’ expectations are lifted with the rising economic tide.